JASON Thin To Thick Extra Volume Hair Spray provides a long-lasting hold for even the most demanding styles. This unique styling aid can also be used as a treatment, ideal for all hair types and protects against UV rays and humidity. 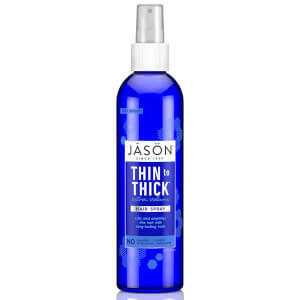 JASON Thin To Thick Extra Volume Hair Spray is perfect for use on thin, fragile and weak hair as it will not dry your hair or make it brittle after continued use. A unique and natural formula, this hairspray also protects against environmental pollutants and the sun’s harmful rays allowing you to style your hair in 100% confidence. Hold bottle upright about 10-15 inches away from the hair.